Ever since I began to crack the whip a few weeks before Birdy was born, I've become a huge believer in the power of a chore chart. I can't be stopped. But my newest chart is created with a nod to my own mother. The Dinner Job List. When we were little, my mother had a typed-up list of jobs on the kitchen refrigerator. Each week, each child was assigned one of the four jobs. And each job consisted of a short list of tasks to get the dinner dishes done. By the time everyone finished their job, the kitchen was clean. Everyone knew exactly what they had to do before they could be excused. And as long as you did a good job, you could get it done as fast as possible. 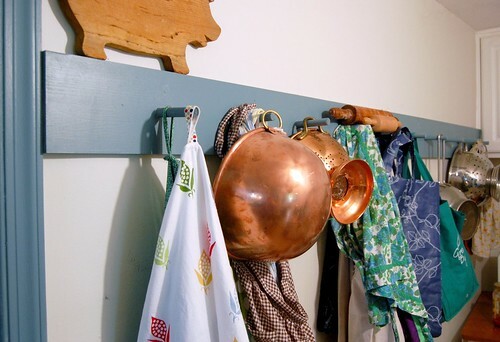 The daunting task of cleaning up the messy kitchen seemed so much more do-able when you only faced a short list of four or five tasks. Now that Mary and Emma have begun having a major role in dinner dishes, I decided it was time to implement the dinner dishes jobs. I'm a big fan and so are they. Emma tells me it's so much easier when you know exactly what you need to do. It seems to keep them focused because they're so anxious to move through their list and "be excused". And I love it too, because the nagging quotient is gone and when all the jobs are shared, I can even slip in a few "extras". The floor gets swept every night. The breakfast table is set and the dish drainer emptied every night. Those things may be standard in your house, but not here–with Dan getting home late from work and bedtimes breathing down our necks. Yes, these things get me giddy. Now, I'm making a list of all the lists that I need to make. Next up, a bedroom chore chart, I believe….my poor children. I love the detailed list. My family usually doesn’t know quite what to do if I give them a chore, but now I see that I didn’t give them enough details. Fantastic, Molly. How old are your girls again? Do you do an allowance. These thoughts are all starting to brew for me. “It’s so much easier when you know exactly what you need to do.” Ain’t that the truth! Molly I think I need to make one of those, if not for my kids..FOR ME! Kitchen clean up seem overwhelming sometimes. I think I’m like your girls. Lists easy confusing in the head..LOL..I think they are moms best friends, or at least that’s what I’m learning. How awesome is this?! Thank you so much for sharing. I love how you worked everything so that people are not in each other’s way! as soon as this construction is finished, i am doing this. you are so smart. This is such a good idea! My kids are 2 and 4 what do you suggest for easy yet helpful chores for them? We had them set their own plates but it causes lots of fight over who gets the ‘special’ cup. But I bet if that became part of the rotating list, it might work better?? I can’t wait until my kids are just a little older so we can do chore charts!!! When every one helps things get done much more quickly! I frequently stop by here, but I don’t think I’ve ever said ‘hello’ before – so I must say ‘hi!’ and tell you that you have inspired me! My girls are 6 and 9, and being so tired in my first trimester with my third, I need their help. So we’re going to implement the chore chart asap! Thank you! You are an inspiration. So much thought, so much order. Love this. I’m going to do one of these for the hubs, never mind the children!! Loving this! I needed a kick in the pants. Chore time is so disorganized right now…they sort of know what they should do, but I only enforce it sometimes and it’s just kind of haphazard. I’m a huge believer in child labor 😉 so I really need to get to work on those chore charts! I can’t wait to see your bedroom list. My girls honestly think they are done but then I come in to hairbows on the floor and drawers hanging open. Your post confirmed that it is a case of mis-matched expectations. Our post-dinner clean-up seems to go smoothly without a list but we’ll see….. Thanks for the inspiration…again! Thank you for this post. I am expecting my 4th in about 7 weeks and my husband is always on me about getting my girls to help. They are about your girls ages and it helps to see what others are capable of. I always underestimate my girls abilities. Thanks again! I like the idea of the chore charts! this is inspiring – I need to start something like this for my 5 year old. The 2 year old copies whatever she does, so I should start this now! Those are great ideas. We had similar things when I was growing up and guess what! I have two fabulous brothers who are a whiz in the kitchen from cooking to cleaning. I am trying to start some things like this with DD bearing in mind how things have been a bit chaotic over the past 6 months. Little things like her getting out the breakfast dishes and putting dirty dishes in the dishwasher, getting her used to drying up non-breakable items when I wash up, and putting saucepans and plasticware away after cleaning. Sounds brilliant! I wish I’d implemented something like this years ago. My lot have always been pretty good- there were certain chores they just had to do. Take the dog out, feed the animals, dishes, clear the table etc. And they did them. Often with maximum silliness aimed at avoidance, fighting, door slamming etc. Number 3 child has always found some way to get sent to his room or lock himself in the toilet. So in the last few years, to avoid this we started to separate it up a bit- one does morning, one does evening etc. But lately it’s come back to me doing a lot of it. My 16 year old leave for school at 7 am. After school there is so much homework (do NOT get me started on homework) and sport and activities, that we eat dinner (sometimes cooked by my 16 year old) later later and it’s a rush to get my 9 and 10 year olds off to bed. THEY hardly do anything. I’m sure my 14 year old is only studying so hard to get straight As to avoid doing chores. My 16 year old, the most helpful is also doing very badly at school. I really feel like I need to shake things up – to work out some new system, because things really aren’t working. 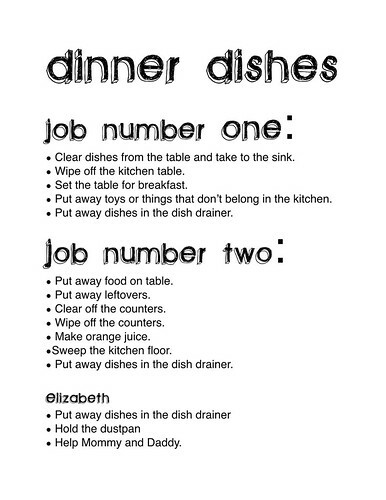 I’m not sure that a chore chart would go down to well with teenagers and pre teens, but I am willing to give it a go! It is time to say that I really like your blog and have been peaking in for a while now—PLEASE post your bedroom chart as well! You inspired me to redo my kitchen chore chart. I saw an earlier comment about accountable kids–we do that and as long as you stick to it—it is great! I always begged my mom to do this as a kid. I love lists. My little 5 year old has been asking for a list of chores….the only problem is that we tried it about a month ago, and I ended up having to remind her about it. How do you stay on top of this? Are there any rewards or consequences? THanks! thank you so much for this–we struggle with mess/organization around here, so this will be helpful for ME as well as my kids in a few years. Our children all have chores. It isn’t posted right now (it should be though – thank you for the reminder). With six children it is essential. on most nights, one of the children do the dishes, another sweeps, another does the table, etc. Two of our children are responsible for the chickens – one for the morning chores, one for the put-to-bed chores. What a great idea! Although I taught my children (now 26 & 21) to help out, this would have been a much better way. Now I’m trying to gently teach my 19 year old stepdaughter how to help out, since she really wasn’t taught in her original home. Such good lessons your girls are learning. I love the list. Will definitely be implementing something like that when my kids are older. Love your blog! Reading your post in “Artful Blogging” made me feel so normal. I love how you are able to capture the beauty in the so many ups and downs of motherhood, housekeeping, and carving out a little bit of time for yourself. Thanks for sharing and I will definitely be back to visit again. Have a great week. I waited far to long to do this – I had a few groans but it all got done! Oh, how I need to return to a chore list! We ebbed & flowed with one. Right now, we’re seeing the ‘rotten fruit’ from lack of having a chore list. You’re right about quickening the time and improving attitudes (including mine)…when everyone works together, it makes short & sweeter work. I’m back – just out of curiosity and the fact that we have 4 children too – how were your mother’s 4 jobs broken down? What was included?